This children's program aired on New York City's WOR-TV (9). Heatherton and his crew entertained kids with games, songs, stories, crafts, hobbies, comedy, puppet skits, magic tricks, interviews with guest performers and personalities, and informational segments. The live segments were interspersed with theatrical Terrytoons and Crusader Rabbit cartoons. 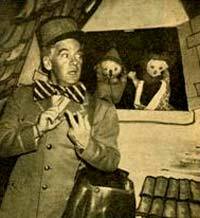 The two puppet characters seen at"The Puppet House Stand"
and"King Orlando"(Manipulated and voiced by Milt Moss). in NYC from Monday September 25,1961 to Friday May 31,1963.
Who will be the first to post here that Ray was the father of Joey Heatherton?